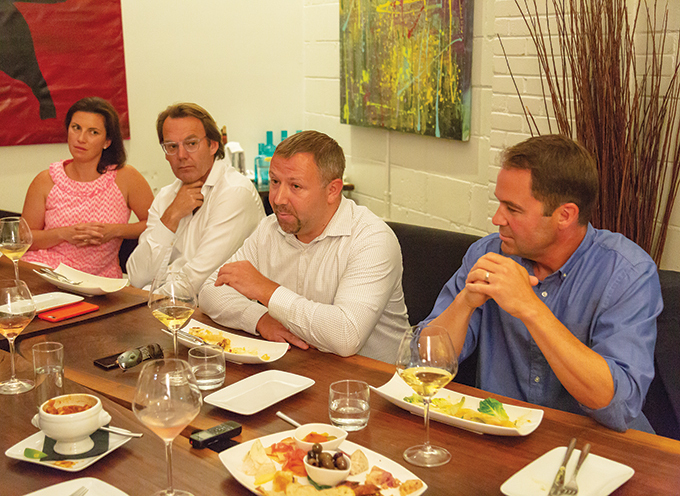 Shannon Lewis, Andrew Saunders, Dominik Majka and Kris Davis dig into good food, wine and debate at strategy magazine’s latest media roundtable. Some of the most pressing issues in the marketing industry are ones that should firmly be in the media agency wheelhouse, things like ad transparency, viewability and brand safety. But recently, clients are the ones pushing for change, with the P&G’s of the world throwing their weight around to get players like Google and Facebook to seriously address their concerns. So are media agencies losing out on what should be a major opportunity to prove their value to clients? Strategy recently sat down with senior leaders from Canadian media agencies to discuss if and how their companies can take a leadership position on the change marketers want to see happen. Joining us around the table were Initiative’s VP of client advice and management Noah Vardon, Media Experts’ SVP Kris Davis, Havas president of media Alexandra Panousis, Cossette Media’s CSO Wes Wolch, CMDC president Shannon Lewis, Starcom’s VP of programmatic Dominik Majka and Globe and Mail CRO Andrew Saunders. Moderated by Josh Kolm and edited by Jennifer Horn. Check back for part two of the discussion next week. When it comes to media, who should be showing leadership – agencies or marketers? Initiative’s Noah Vardon: I think media leaders should be part of the conversation. I do think that a lot of these challenges are global, so what impact do they have on regulations within our jurisdiction? We’re setting a lot of standards here in Canada that global markets are looking at. We recently held a digital summit with of our clients from all of our agencies at The Globe and Mail. We talked about issues with digital, we had a panel with our clients, it was a very frank discussion. We even brought Google and Facebook into the conversation, because we didn’t want to be talking about them without their point of view, and I think that’s leadership. We were the first to come out and say YouTube needs to have a third-party verification system that was equivalent to what we would hold standard, and we were public about that. So I think these things are happening. Media Experts’ Kris Davis: I think media obviously has to take a leadership position – yes, there are higher-level deals, but I think it’s ultimately the people who are on the frontlines executing them on behalf of their clients that need to be leaders. And I think if you have programmatic buying and that type of execution, you need smart people who are empowered and who are keeping an eye on things. So leadership’s got to come from the top, but it’s also got to come throughout the organization. What opportunities are there for media agencies to provide value and show leadership for clients? Cossette’s Wes Wolch: I don’t think people realize the opportunity we have. Media agencies have 80% of the budget. We have data to deliver big insights. And we have the first look at all the latest innovation. That’s an amazing position to be in. But I’ve never worked in an industry with so many people that have strategy in their title that cannot find an intake for the life of them. And we get into pitch after pitch and we talk about efficiency, efficiency, efficiency. It’s like I can buy you a whole bunch of cheap stuff, but it doesn’t mean that it’s actually going to be effective. Wolch: No, we’re not selling that skill. Havas’ Alex Panousis: There are few people today that have that Rob Young [at PHD] knowledge base. We don’t value that skill, or we can’t afford that skill, and we’re not training in that skill. Panousis: Potentially. But what we’ve done is we’ve commoditized. What are the trends right now? It’s that consultants are taking over and clients are bringing a lot in-house. So if they felt that we were adding value and doing a great job, why are they doing those things? Wolch: Because they understand the value of data. CMDC’s Shannon Lewis: They do, and I think that’s why media agencies are hiring data scientists and more content teams. The value is how you drive that insight. We’re the closest to consumers. If you look at the Accentures of the world – yes, they’re getting into programmatic buying, but at the end of the day, we’re the ones who are coming up with compelling campaigns and personalization with scale. Panousis: I’m optimistic too, but I want to encourage more movement. The problem is we’re not open to having the other side of the conversation. The industry is not great. There’s been fraud, growth is down, 30% attrition is the average – according to most CEOs of media agencies in Toronto – and on we go. So the reality is that there are problems. But the good thing is we have incredible opportunities. Media agencies can see the connecting content, tech, data and innovation in really interesting ways. That has to start to rise and what we have to stop doing is charging $85 an hour and throwing content in for free. Accenture doesn’t do that. Wolch: Nobody does that, except for media. Because, again, it’s a procurement-based decision. The same people that determine where they buy their staples and their paper are the same people that determine where 80% of their budget goes. Vardon: As a previous client I can tell you that in a lot of cases there is procurement-led decisions, but a lot of the pitches were not procurement-led. I think certainly procurement helps drive costs down because that is one of the KPIs. And there are some global clients that look to procurement to lead their media decisions, which I don’t think is the right call, but there are a lot of clients that look for value.